To learn more or request authorization for a guest trainer or haul-in privileges, call or email our Barn Desk. Equine Insight is the Equine Facilitated Psychotherapy practice of Judy Weston-Thompson, Certified Equine Interactive Professional-Mental Health (CEIP-MH) and Marriage and Family Therapist MFT. Judy and her equine partners, Baron, Calysta and Caesar, have their own quiet corner of Indian Valley Stables. With its own private arena and indoor meeting space, Equine Insights allows clients to experience the beautiful, quiet and profound healing energy of horses while working on personal needs in a calm, serene space. A licensed and practicing MFT since 1987, Judy has been incorporating EFP into her full-time practice since 2006. Practiced all over the world, EFP is the perfect replacement and/or compliment to classic on-the-couch office therapy. Evidence has shown the benefits of EFP for those who suffer depression, anxiety, addiction, trauma and loss. Judy has also seen marked improvement in symptoms of ADD/ADHD, eating disorders, and learning disorders. Studies continue to show how EFP promotes self-esteem and self-confidence while improving communication skills, impulse control, and problem-solving skills. Please visit Judy’s Workshops for more information about group activities and sign-ups. For an initial assessment with Judy as to whether EFP is right for you, contact her via phone (415) 457-3800, or email her at equineinsight@aol.com. 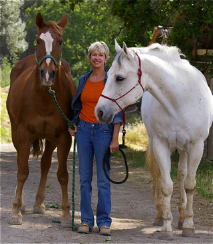 At our barn since 2002, Tricia develops horses with the Art2Ride Classical Foundation Training. This philosophy establishes supple, relaxed horses whose abilities are the result of correct development and emotional well-being. This culminates in a harmonious partnership between horse and rider without resistance. Growing up as a working student in her native England, Tricia discovered her love of horses and the power of the horse-human relationship. Upon coming to the US, through rescuing her thoroughbred from abuse, she learned that she possessed the sympathetic, patient hand needed for horses deemed “difficult.” Tricia sought training methods from every professional and discipline she could find – including Brian Neubert and Mark Rashid. Ultimately she found that in aggregating the best of all of those teachers – and adopting the Art2Ride method – she was able to school to 4th level on her troubled OTTB. Having found an Art2Ride clinic in 2010, Tricia immediately felt she’d found the missing pieces in her training and began practicing. She was asked to be an associate trainer shortly after and has been successfully sharing this knowledge through her business and participating in A2R clinics. Tricia’s latest triumph is developing Delilah, a completely green, unbroke 3 year old mare. Without having to accommodate previous teaching, Delilah is an example of a properly developed horse and is used in helping riders engage with their own horses in the Art2Ride method. Contact Tricia at 415.613.2244 or shebahsmum@yahoo.com for more information or schedule lessons.